Patricia Gándara, a professor of graduate education and co-director of the UCLA Civil Rights Project/Proyecto Civil shares the results of her research on how balanced bilinguals are more successful. In a globalized, digitized world, new research shows the key to employability and higher earnings hinges on something South Florida residents learned was crucial long ago – being equally fluent in more than one language. Gándara, co-author of a new book showcasing research on the performance of bilinguals, “The Bilingual Advantage: Language, Literacy, and the U.S. Labor Market,” also is co-director of the Civil Rights Project/Proyecto Derechos Civiles at UCLA. 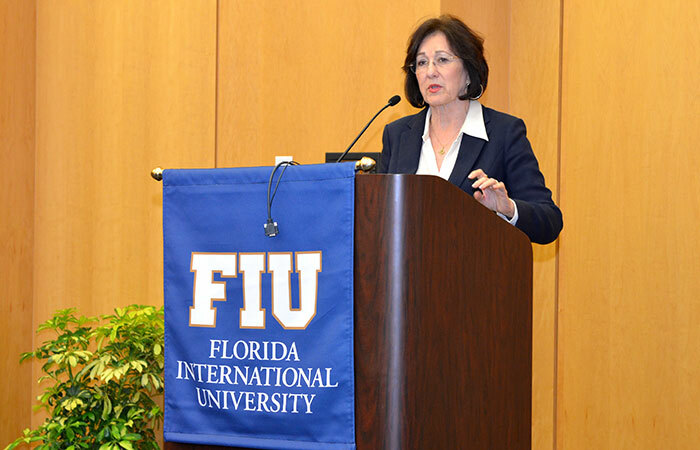 For at least one FIU student, Gándara provided validation for her desire to remain proficient in her native language while she perfected English. At first, Gándara shocked the audience by sharing that prior researched showed there was no economic advantage for bilingual members of society, and in fact, they earned less. However, Gándara said the original studies were flawed because they focused on census data that did not accurately distinguish the level of language proficiency among respondents. This is key because balanced bilinguals – those who are equally proficient in both languages – tend to do far better than others who were more literate in one language compared to the other. We shouldn’t rest easy, Gándara warned: This advantage could disappear within three generations if society didn’t take steps to incorporate bilingual education in schools.